Dungeons and Dragons (D&D): Sometimes life is a dice roll. Don’t get too attached to your D&D character, they may be annihilated within hours into the game depending on your dungeon master. I spent hours on my first character sheet coming up with a great back story and carefully assigning ability values. Despite time and effort, my character was mortally wounded and I had to quickly roll a new character for the remainder of the quest. Likewise in the real world, ample time and effort may be invested into planning a particular career path which ultimately might become unfeasible. Factors out of your control like the job market, loss of interest, or simply life can set you back semesters or even years of career development. Re-roll your career path and stay flexible. Use that same in-game imagination to find a career that best fits your abilities. You might even find a chat with a Career Counselor more fruitful than probing an NPC for information with failed persuasion rolls. Settlers of Catan: Take advantage of your resources. In my opinion, Catan is a close second to Mario Kart for games that wound friendships: “Oh you want this wheat?…TOO BAD”. If you are familiar with your opponents you know what their 10 point win case strategy is; building roads, constructing houses or collecting development cards. This also means you know which resources you can starve your opponents from. In an ideal and moral world, your career building resources are not being stolen from you. However, you might as well discard your cash if you do not take advantage of UMD’s on-campus resources! Part of your tuition funds resources like those provided at Career Internship Services. Choose a major, hunt for an internship, prep for a career fair, explore graduate schools and look for a full-time job. Our career resources may not be not as straight forward as wheat, lumber, brick, ore, and sheep. Personally, I do not play poker but after taking Introduction to Probability and Statistics I respect the mathematical and emotional intelligence required to become a pro-player. My favorite poker anecdote is when professional poker player Annie Duke won the 2004 World Series of Poker Tournament of Champions. Duke struggled during the World Series playing behind all day and in one case taking far too much time to make a decision on live television. I equate applying for internships, receiving offers and declining offers to playing poker with a little more control. Throughout college, I have navigated a spectrum of internship challenges. Sometimes there is a lack of internship offers. Sometimes there are too many offers – which enables the ability to negotiate an hourly pay and benefits increase. Sometimes there is a need to respectfully decline offers. Throughout this journey I have asked for the guidance of career counselors, They can read drafts of emails, brainstorm respectful rejection letters, and help keep doors open for future opportunities. Magic The Gathering: Timing is everything. Avoid engaging in conversation with the CEO of your favorite company when your mouth is full of hors d’oeuvres. Do not visit your top pick company at the job fair first, settle into the environment and gain confidence. Wait until the recruiter’s table is less crowded to chat and present your resume. Career and Internship Services hosts workshops during the school year about how to be successful at a job fair. Job fairs begin as early as September! Warhammer 40k: Change with the rule changes. 40k got a huge overhaul with new 8th edition rules replacing the 2014 7th edition. Unlike previous rule updates, the game was redesigned to make it easier for new players (myself included) while letting current players use miniatures from the 90s. Most 40k community members are keeping fluid during rule changes in hopes the playerbase will grow. Flexibility is a highly valuable trait of any employee, leader or entrepreneur. Staying flexible can also mean you keep career opportunities open when attending UMD. Consider applying for a work study position, land an internship, or conduct an informational interview with a professional in an industry you are interested in. Sometimes a one track mind on what your future should look like can eliminate perfectly good career options with equal or greater success. Keep your options and dice on the table. If a Game of Thrones character walked into Career and Internship Services… What kinds of questions would they ask? Would they come in with a plan of action? Or be completely bamboozled? Despite confidence he could land an internship by sweet talking recruiters without even practicing an elevator speech, Tyrion decided to make use of all available resources and seek professional career advice. Tyrion strutted into SCC 22 with a battle plan – draft of a resume, draft of a cover letter and a couple of positions he wanted to apply for. Among the desired positions included a Pathways Internship with the Department of Defense, a summer internship with the NSA (National Security Agency) and a semester long opportunity at the White House. Tyrion picked a Peer Educator’s brain, finding ways to reword his accomplishments and best communicate his qualifications. Slamming her hands on our welcome desk Daenerys demanded an internship. Surprised that the … enthusiasm… was coming from a student and not a parent, a Peer Educator explained that students have to pick out desired opportunities and the office helps with the application process. Daenerys understood that landing an internship would set her on the path to victory to rule the Seven Kingdoms, whatever that means, but did not know what industry she would fit best in. A Peer Educator set her up with career assessments; StrengthsQuest, Myers Briggs Type Indicator (MBTI), and the Strong Interest Inventory. After discussing results with a Career Counselor, Daenerys found her top strength is “Activator”, she identifies as an INFP (Introverted, Intuitive, Feeling, and Perceiving) through the MBTI, and she would be good at circuit speaking and political campaign interning. John is the comeback kid of our office. He has been rejected from career opportunities after online applications, interviews, and cold calling but does not lose hope. John Snow first came into the SCC 22 knowing nothing except that he wanted to work in cooler climates, like Antarctica or Alaska. After scheduling an appointment and meeting with a career counselor, John found a great research opportunity studying ice cores with the United States Antarctica Program, job openings for students in Alaska, and plans to talk to UMD’s Study Abroad Office about a semester in Europe. Sitting on a throne of academic awards, A+ essays and a senior design project Cersei asks “Now what?”. She, unfortunately, waited until her senior year to visit Career and Internship Services. Although it is ideal to stop in SCC 22 as early as freshman year it is not too late for Cersei to take complete control of her future! Fortunately during her years at UMD Cersei was involved in student organizations such as Greek life, and Industrial/Organizational Psychology Club, Political Science Association, Socratic Society and rugby to enhance her resume. A Peer Educator showed Cersei how to use GoldPASS, a portal of job postings especially catered for University of Minnesota schools students. After her resume was approved Cersei found dozens of jobs she was qualified for. Shy yet armed with tons of knowledge Sam sought interviewing help in preparation for the Fall E-Fest Job and Internship Fair. Sam wants to intern at an engineering firm next summer, familiarize himself with popular interview questions and curb his social awkwardness. A Peer Educator shared helpful interview tips with Sam and showed him how to use InterviewStream, an online interview practice tool. Sam quickly became conscious about the number of “um”s he uses. Oh, How I Met Your Mother. A show for when you’re bored, when you want to veg out for half an hour, or when you need a little pick-me-up at the end of the day. To celebrate HIMYM and all the lovely times it has given us, here are a few lessons I learned from the show on how to make your life legen-wait for it-DARY! Say yes to new opportunities. You never know what class you’ll actually love, what activity will give you some direction, or what experience might be life-changing. If you don’t say yes and try new things, you might miss out on gaining a valuable experience or being part of an awesome story. Think about the front porch. Front porch-worthy friends are the best friends. If you can see someone being in your life years in the future, work hard to keep that person around. On the flip side, if you don’t want someone in your future, just cut them loose. It’s okay to be picky with your inner circle. Some relationships are toxic, and you don’t need that in your life. Nothing good happens after 2am – a classic HIMYM lesson. You think you need to pull an all-nighter to study for that “super-important” test tomorrow? You probably don’t. You think it’s a good idea to sleep a grand total of 20 hours throughout the week? It’s not. Getting straight A’s or playing 10 straight hours of League of Legends (I’m looking at you, roommates) isn’t that important. Just go to bed. Don’t cling to the past. The years of starting college, graduating, and moving on to whatever is next are exciting, but also a little frightening (take it from the graduating senior). The unknown is scary, but holding back or pausing your plans to live in the situation you find comfortable or familiar isn’t the answer. Sometimes, you’re just going to have to wait for it. The things you want most often won’t come easily, and if they do, you might need to set higher goals. Keep on working for what you want, and eventually, your waiting will be rewarded. In a previous post, I talked about the lessons I learned about others from reading and watching Harry Potter. Now, I will look at the wisdom of Harry Potter through what it taught me about myself. Living in a cupboard isn’t fun. I mean this literally, but figuratively as well. It’s easy to feel confined by the walls you or others have built around you, but those walls shouldn’t become your prison. It’s easy to hide parts of you or not acknowledge them to others out of fear of rejection, embarrassment, or regret, but no one deserves to live cramped and uncomfortable inside a cupboard with a ceiling that sprinkles dust on them when people walk overhead. Hiding yourself seems like the easier option at first, but it’s likely going to hurt you as time goes on. Whatever it is you’re hiding, whether it be that you turn into a werewolf at the full moon or something a little less extreme, that thing doesn’t define you, so don’t let it dictate how you live. Don’t be afraid of your darker parts. Fun fact: J.K. Rowling created dementors as a metaphor for depression. For her, these haunting figures represented a very real darkness she had experienced in her life. Everyone has experienced darkness, whether that darkness has passed or it follows them around, sucking all the joy out of their world. For many of us, the instinct to ignore or hide from such parts is natural. However, these parts of us are just as important to who we are as the parts we love. Whether it be something you aren’t proud of, a secret you’re holding, or something difficult that has happened to you, these things can build up in precarious piles around the edges of your life until they inevitably fall down on you. Instead of waiting for them to collapse, embrace the darker parts of you and your life. Confronting the cobwebby corners of your mind forces you to acknowledge difficult things, yes, but through the process, you learn that those things have helped make you who you are. 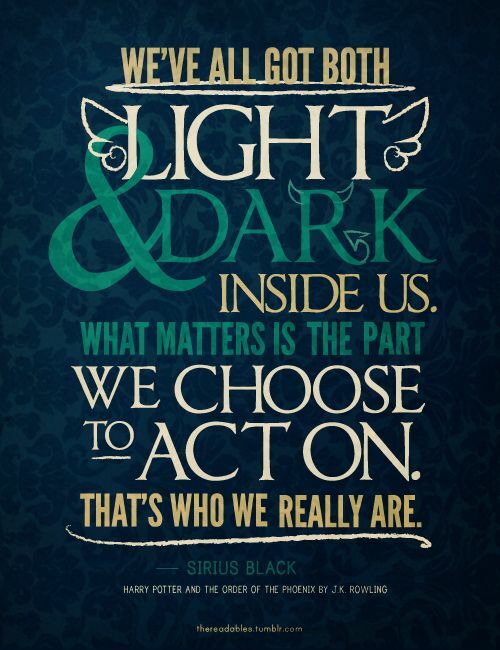 Take a note from Rowling and banish your darkness with a patronus charm. Or, you know, a more muggle-like coping mechanism. Whatever works. If you’ve ever been in a position which required you to forego your values to meet expectations or requirements, you know it isn’t easy. And if you’re like me, it’s painful. It’s easier to cave in and follow expectations, no doubt, but there are times when obedience isn’t the answer. Consider our favorite magical trio. Harry, Ron, and Hermione chose to begin Dumbledore’s Army to fight against the restrictive and ineffective teaching policies of Hogwarts during the Umbridge days (shudder). If you’ve seen the movies or read the books (and if you haven’t, stop reading this now and go do that), you know this endeavor wasn’t without challenges or consequences. However, the students’ magical training helped keep them alive. While the related situations in your life probably aren’t of life or death importance (and if they are, I would advise you to stop reading this now as well and seek help instead), this same idea applies. It may be easier in the moment to do something you don’t believe in, but the regret that may come later just isn’t worth it. The challenges, failures, and successes of the Harry Potter characters may be more magical than the ones we face (unfortunately), but they still can provide us with lessons we can apply to our own muggle lives. In my next and last post in this series, I will talk about the lessons the wizarding world taught me about success. I’ve always loved Harry Potter. As a kid, I loved the magic of it, and longed to be a part of that world. As I’ve gotten older, I’ve learned to appreciate different parts of the story my younger self couldn’t. Harry Potter is a story about witches and wizards and the cool spells they cast and evil villains they defeat, sure, but it’s much deeper than that. Harry Potter and the magical world he lives in can provide us with valuable lessons about others, ourselves, and our lives. 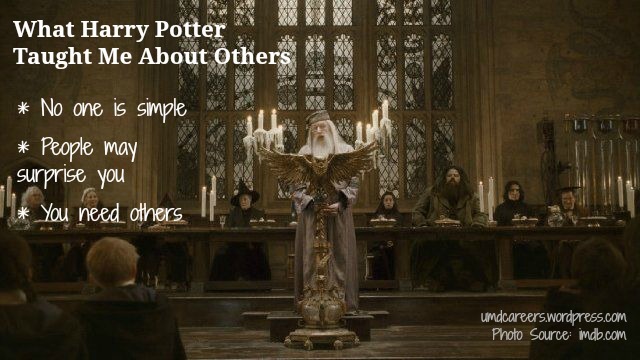 To start, I’ll outline a few of the most important lessons Harry Potter taught me about others. First impressions are important, and their effects are enduring. Your gut instinct can be a useful tool in discerning “good and bad,” or “right and wrong.” We know these are true, but it’s also true that the impressions and ideas we have of people can be false, or at least oversimplified. Draco Malfoy, when taken at face value, was a cruel bully working for the dark side. This impression, while admittedly not inaccurate, doesn’t reflect the fact that Draco was raised in a family that not only encouraged, but basically forced a cruel and aggressive treatment of others. In order to be “good,” Draco would have had to oppose his family and everything he’d been taught, not to mention He Who Must Not Be Named. Maybe Draco would have been the hero of the story if raised in a different environment, but that’s not the life he was given. While circumstance isn’t enough to justify cruelty, Draco’s story is a perfect example of why we can’t rely on a person’s outward appearance or interaction with others to determine their true character. In the same way that we can’t always rely on our impressions or on a person’s behavior to determine their “goodness,” we can’t always rely on our past experience with them to predict what we will see of them in the future. Kreacher, the house elf that was bound to serve the Black family, didn’t attempt to hide his hatred for Mudbloods (and Hermione, by extension), Harry, and anyone who associated with either, and did whatever was in his power to resist helping them. He was a character who was easy to hate and appeared to be one with no redeeming qualities. However, Kreacher eventually changed his tune, and showed up to fight against Voldemort and the Death Eaters at the Battle of Hogwarts. Based on Kreacher’s past, no one would expect him to fight against the side he had been loyal to throughout his life. Kreacher’s character development shows that if we allow for the opportunity for people to surprise us, they just might end up fighting evil with us (or, you know, a difficult class…same thing). Harry was always a brave and courageous person, willing to fight the battles of the wizarding world all on his own. Bravery, courage, and independence are certainly positive traits to possess, but there comes a time when the desire to do it on your own needs to be suspended and you need to turn to your support system to help you out. Harry couldn’t have accomplished what he did without the support of others, particularly his partners in crime, Ron and Hermione. They never left his side, stuck up for him when others challenged or questioned him, and helped him fight any dementors or death eaters or obnoxious classmates who crossed his path. It is essential to build and maintain a quality support system – a group of people who complement who you are, are stronger where you are weaker, and who are able and willing to do whatever they can to help you succeed. With the world of Harry Potter, J.K. Rowling created a set of rich, complex characters whose stories can provide a guideline of how best to interact with and understand those around us, whether they be friends, enemies, or strangers. In future posts, I will look at more bits of wisdom Harry Potter taught me.